I have a wonderful client who refers to the back of her thighs as “the dead zone”! So we always do this exercise in class, just for her. It’s a great exercise to strengthen and shape the backs of your thighs and your glutes. And it will strengthen your deepest abs so that your tummy is flatter! Your primary goal doing this exercise is to keep your hips level. Start with both feet flat on the floor. Arms rest by your sides. Starting at your tailbone, start to curl your spine up off the mat one vertebra at a time until your hips are floating in the air. Check if your hips are level, left to right as in the first photo. Take a deep breath in and as you exhale, draw your navel towards your spine and lift your right foot off the mat just a couple of inches as in the second (are your hips still level???). Place your foot down and switch. Work up to doing 10 repetitions in total (5 each side). Modification: If you cannot lift your foot off, try lifting just your heel off the mat keeping your toes down, as if you were wearing a high heel on one foot. Once your hamstrings, glutes and abs get stronger, try lifting the whole foot. I was working with a new client today who was having trouble doing ab work because her neck hurt so much. This client is in her 40’s, sits at a desk all day and has what we term a “kyphotic” or “round-shouldered” posture. This type of posture is really common nowadays because many of us sit for long, long periods of time. If the spine is not properly supported, the upper back rounds too much and the head goes forward. This puts a lot of strain on the neck. Over time, the neck muscles become overly tight and cannot relax. 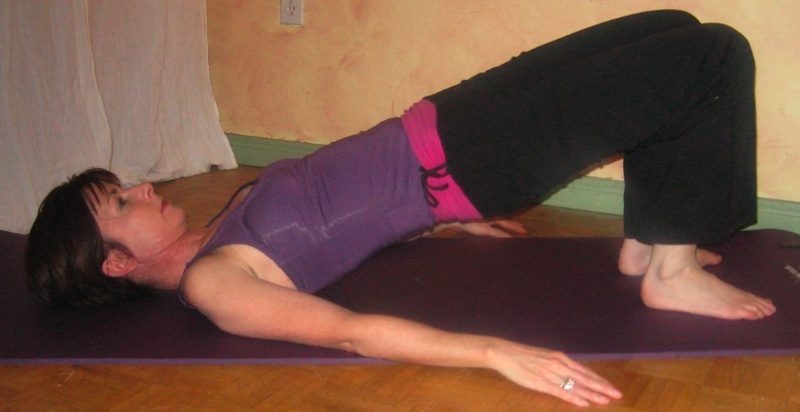 All that to say that when you do Pilates, the neck tends to strain a lot. Here’s my trick to help this little problem. Lie on your back, with your knees bent. Interlace your fingers together and place them behind the back of your head. As you lie there, feel how heavy your head is in your hands. It weighs between 8 and 12 pounds depending on the person so it will feel quite heavy! Now, drop your chin slightly and bring your elbows forward just enough that you can see them in your peripheral. As you exhale, pick up your head with your hands so that it is just 1 or 2 inches off the floor. With your head lifted, feel how heavy it is. If your head feels lighter than it did when you were resting on the floor, that tells me that you are over-using your neck muscles and they are going to get cranky! Now keep your head lifted and see if you can let it rest heavy in your hands. Feel the difference? Your neck relaxes! When I teach, I always cue my clients to have a “heavy head in their hands” when doing any sort of abdominal work.